Ever wondered, how you apply for a driver's license? How you replace your driver's license if you lose it? Look no further - your questions will be answered here! HOW DO YOU APPLY FOR A DRIVER'S LICENSE? STEP 1: Acquire a Pennsylvania Driver's Manual from a local Driver License Center, or on this website: English (PDF) or Spanish (PDF). An audio version of the manual is also available. STEP 2: Have a physician assistant, certified registered nurse practitioner, or chiropractor conduct a physical examination and complete Form DL-180 (PDF), "Non-Commercial Learner's Permit Application." The completed DL-180TD (PDF) (if under the age 18). This form must be completed by a parent, guardian, or spouse who is 18 years of age or older. Proof of identity, which is listed on reverse side of DL-180 (PDF). STEP 4: Take your eye screening and Knowledge Test at a PennDOT Driver License Center. Once passed, you will be issued your Initial Learner's Permit. STEP 5: If you are under 18, you must complete 65 hours of adult-supervised skill building, which includes no less than ten hours of nighttime driving and five (5) hours of bad weather driving, as well as 6 month waiting period. Motorcycle permit holders must take the Basic Rider Course in place of the ten hours of nighttime driving and five (5) hours of bad weather driving. For more information on obtaining a class M license please refer to the Motorcycle Information Center. STEP 6: Schedule a road test either online or by calling 1-800-423-5542. WHAT DO YOU DO IF YOU LOSE YOUR LICENSE? A Pennsylvania duplicate Non-Commercial Driver's License is issued when the current product is lost, stolen, mutilated, or never received. If PennDOT has your photo and signature on file, you can apply for a duplicate non-commercial license online. When your application is complete, you will be able to print off a temporary driver's license good for 15 days while your duplicate is processed and mailed. *If you have not reconciled an outstanding sanction(s) in another state(s), PennDOT is unable to issue you any driver's license product. For more information, please see the National Driver Register Fact Sheet (PDF). STEP 1: Complete Form DL-80 (PDF), "Non-Commercial Driver’s License Application to Change/Correct/Replace." STEP 2: Make a check or money order payable to PennDOT for the appropriate fee. STEP 3: Mail application and check or money order to: PennDOT, P.O. Box 68272, Harrisburg, PA 17106-8272. STEP 4: If your picture is on file, you will receive a duplicate Non-Commercial Driver’s License with your current picture. If no picture is on file, a camera card will be mailed to the address on file with PennDOT. If you receive a camera card, you must appear at a photo center to obtain a photo for a Non-Commercial Driver's License. PennDOT uses state-of-the-art facial recognition technology when an individual has their photo taken for their driver’s license/identification card renewal. STEP 5: You may go to an Online Messenger Service or Driver License Center and apply for a duplicate Non-Commercial Driver’s license by using the DL-80 (PDF) form. The messenger service can issue the customer an interim license that is valid for 15 days. This will allow you to have a valid product in your possession while PennDOT processes the duplicate request. Note: Messenger service fees may apply for these services. A Pennsylvania duplicate Commercial Driver's License is issued when the current product is lost, stolen, mutilated, or never received. *If you have not reconciled an outstanding sanction(s) in another state(s), PennDOT is unable to issue you any driver's license product. For more information, please see the National Driver Register Fact Sheet (PDF). Online services are not available for duplicate commercial driver's licenses. MAIL-IN PROCESS: STEP 1: Complete Form DL-80CD (PDF), "Application for Change/Correction/Replacement of Commercial Driver's License." STEP 4: If your picture is on file, you will receive a duplicate Commercial Driver's License with your current picture. If no picture is on file, a camera card will be mailed to the address on file with PennDOT. If you receive a camera card, you must appear at a photo center to obtain a duplicate Commercial Driver’s License. PennDOT uses state-of-the-art facial recognition technology when an individual has their photo taken for their driver’s license/identification card renewal. STEP 5: You may go to a Driver License Center and apply for a duplicate license by using the DL-80CD (PDF) form. HOW DO YOU RENEW YOUR VEHICLE REGISTRATION? To renew online you will need your registration plate number, title number, insurance information, odometer reading, a valid credit card, and a printer. At the end of the transaction, you will be given the opportunity to print a receipt and a permanent registration credential. PennDOT no longer mails a registration card for registrations renewed online. Please refer to Form MV-70S, "Bureau of Motor Vehicles Schedule of Fees,"for a complete listing of current renewal fees and for a reduced processing fee in lieu of registration for individuals who qualify for retired status. The applicant’s county of residence may implement a fee for each non-exempt vehicle registered to an address in that county. For more information regarding the fee for local use, refer to the Fee for Local Use – Participating Counties Fact Sheet , found on our website. For complete instructions visit: http://www.dmv.pa.gov/vehicle-services/title-registration/pages/renew-registration.aspx. 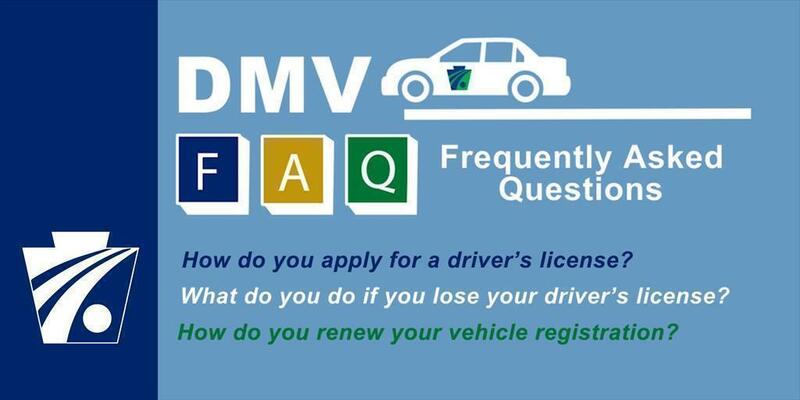 If you have additional questions, visit our DMV FAQ webpage here. For more information on Driver and Vehicle Services, visit http://www.dmv.pa.gov/Pages/default.aspx.